An off-season project at Pumphouse is underway to add a white water play wave. The new feature will stretch perpendicular across the river about 75% of the channel width just above the second boat ramp, or also known as the hand launch ramp just below the central parking area. It’s designed to create a standing wave for “play boaters”, while still allowing for downstream passage either through the feature or around the river right side of the obstacle via a boat passage lane. The basic concept of how the feature will work is an obstacle is anchored to the riverbed that causes water to flow up and over it and the downstream side of the obstacle creates a “Standing Wave”. The wave is stationary and allows for boaters and boarders to surf without drifting down the river. For those of you that have floated the lower Colorado, you may be familiar with the Glenwood Springs play wave just above the West Glenwood Bridge. In fact, the same engineer that designed and built that feature in Glenwood, is doing the work at Pumphouse. Although it is being built on public lands managed by the Bureau of Land Management, the project is actually being completed by Grand County with help via funding partners. Total cost of the project is $1.6 million, with considerable contributions made by Eagle County, The Colorado Water Conservation Board, Department of Local Affairs and of course Grand County. The BLM’s role in the process is to help facilitate the project by permitting the construction and “Right of Way”. 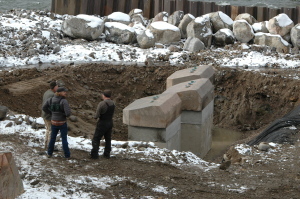 The actual construction phase of the project began in November and is scheduled to wrap up by March, just in time for the spring float season. The project is not without skeptics, us included. Concerns stem mostly from issues regarding traffic flow on an already busy stretch of river. Pumphouse can see upwards of 70,000 visitors a year and at times the boat launches can seem as busy as the tarmac at O’Hare International. Is adding this kind of stationary feature, designed to draw an additional concentration of users, the right idea for such a busy location? In order to answer that, it is important to look at the greater benefit to the river of this project. By creating the “improvement”, Grand County has also secured a junior water right that will help maintain minimum in stream flows. In maintaining these minimum flows, it will be beneficial to trout by protecting critical habitat, as well as sustainable water temperatures for survival. The hope is that in all but the most severe droughts, we should not see flows as low and warm as in 2002-2004. Keeping in mind the “big picture”, we believe the benefits will far outweigh the potential for some localized congestion. And with a little bit of awareness by all river users of other parties on the water this can be a win-win for all interests along the Colorado River.